The Nokia Lumia 510 is basically a further trimmed down version of last year's Lumia 610. It offers less in an attempt to reduce the price even more, while still providing a complete smartphone experience. The 510 also has a larger screen than the 610 (although of the same resolution), so it's more in line with the current trend. The Nokia Lumia 510 costs about €160 at launch, which is not a bad price if you consider that a full-featured Office suite and a life-time SatNav license are part of the deal. The Windows Phone 7.8 update managed to spray some of the WP 8.0 goodies around the park and has helped improve the UI, while the excellent social skills and the auto-focus 5MP camera turn this into a package that's seemingly too hard to resist. Unfortunately, there's a catch. Not that any smartphone in this price range could realistically be expected to be perfect, but the 4GB storage is nowhere near enough for anyone with even a hint of multimedia addiction. 256MB of RAM is not just a number either that looks bad on the spec sheet - it takes its toll on the user experience by ruling out some key apps (like Skype). There are some Windows Phone 7 alternatives that are certain to get the 7.8 update(if they haven't already). About the same money will get you the Lumia 610, while the Lumia 710 costs some €20 more than the 510. 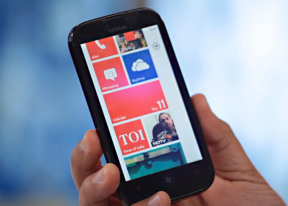 The Lumia 610 doubles the storage up to 8GB, but reduces the screen size, while the 710 offers better-screen quality, faster and more capable hardware and also doubles the RAM and storage. Samsung's WP7 offer, the Omnia W, comes with a Super AMOLED screen, a better chipset, which allows it to deliver the full WP7.8 experience, but no lifetime navigation. Ultimately, the best value offering might be outside the Windows Phone 7 realm. The Sony Xperia U costs the same as the Lumia 510, but offers a vastly superior chipset with dual-core CPUs, double the storage and the immense app catalog of Android. The screen is smaller, but the pixel count has actually gone up and the build quality is better, not to mention that the Google OS native functionality far exceeds that of WP7.8. For an extra €25, you can even get the Sony Xperia sola and it'll even throw in a microSD card slot. Yet, if your mind is set on Windows Phone, the Lumia 510 is by far the most affordable option. As a reference, the WP8-powered equivalent, the Lumia 620, costs good 100 euro more. Windows Phone 7.8 may miss on a lot of opportunities that are readily available to the next generation of the OS, but it's got plenty to offer to users coming from feature phones. A nicely designed interface, a very reputable navigation solution that is available offline and document editing are all important checkboxes and the Nokia Lumia 510 has them ticked.